We specialise in and accurate thermography scans that deliver the data you can rely on. Thermoscan specialises in providing accurate thermal imaging scans and preventive maintenance reports. Our expert thermographers are ISO Safety and Quality Certified to deliver accurate, useful reports. We’re 100% Independent: unlike some electrical contractors who invent “phantom faults"... so they can charge to fix them! "Fast quote, fast report, guaranteed". We will provide a quote within 1 business day, and a detailed report within 1 business day of completing a scan - GUARANTEED. Businesses and commercial property owners have an obligation to provide a safe environment for their employees and clients. We work exclusively with building managers, commercial property owners and risk assessment professionals to ensure that obligations are met. The benefits of thermal imagery don’t stop there. Proactively identifying and managing risks also results in reduced down-time, cost savings and greater productivity. Their current or prospective insurance policy requires Electrical Thermal Imaging scans. 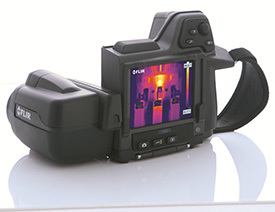 It’s become commonplace for insurance companies to recommend thermal imaging being completed regularly. At Thermoscan, we analyse your equipment, but don’t have the conflict of interest of fixing faults we find. You know we provide unbiased, professional advice – with no hidden agenda – of finding ‘faults’ that need our ‘professional attention’.